Chopped Asparagus Salad, is a healthy gluten free bean salad perfect for spring ~ add some great canned tuna and hard cooked eggs to make it a main course salad. This no mayo salad is great for barbecues and picnics! First I blanch the asparagus ever so briefly to take the raw edge off. I bring a pan of water to a boil, plunge the asparagus in, and remove it in exactly 60 seconds. Set the timer and don't leave it in the water any longer than that. (The only exception is if your asparagus stalks are very thick.) Rinse in cold water, or drop the asparagus into a bowl of ice water to stop the cooking and preserve the color. Once completely cold, dry on a clean towel. Slice the stalks into 2 inch pieces, on the diagonal. 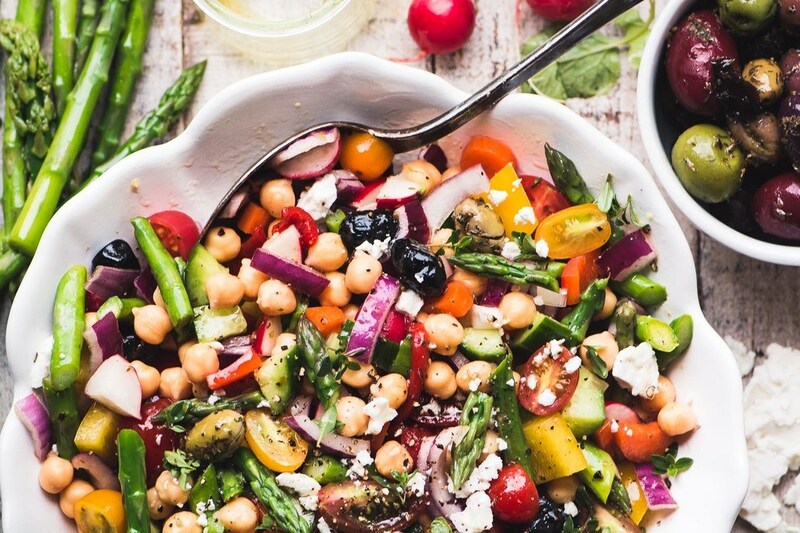 Add the asparagus, chickpeas, carrots, radishes, cukes, onions, tomatoes, peppers, and olives to a large mixing bowl. Toss with enough dressing to thoroughly moisten, and season with salt and pepper to taste. Let the salad chill in the refrigerator until ready to serve, give it at least an hour. Toss the salad and add more dressing if needed. Transfer to a serving bowl, top with the feta cheese and fresh thyme. To make the dressing: Whisk together the ingredients and taste to adjust any of them.